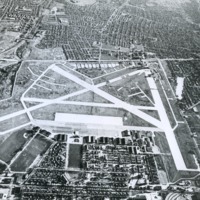 Aerial view of Mitchel Field, looking north. 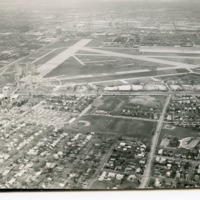 Aerial view of Mitchel Field, looking north. Runways in the middleground; Hofstra University campus in middleground, at left; parts of Hempstead Village and Uniondale appear south of Hempstead Turnpike in middle and foreground. 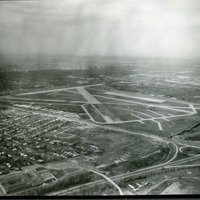 Aerial view of Mitchel Field looking north. Runways are in the middleground; a portion of the Hofstra University campus is in middleground, at left; parts of Hempstead Village and Uniondale appear south of Hempstead Turnpike, in foreground. 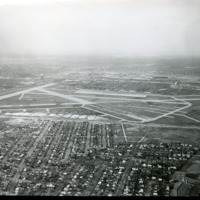 Aerial view of Mitchel Field, looking South. Military buildings are pictured in foreground; runways are in the middleground. Parts of Hempstead Village and Uniondale appear south of Hempstead Turnpike, in background.